The Casa Do Forno Cottage (Bread Oven House) is a one bedroom rustic duplex cottage tastefully decorated, boasting many original features including a "crows nest" lounge and bursting with character. The bedroom has a double bed, wardrobe and sloping cane ceilings with wooden beams and white washed walls. The bathroom has a shower with a tiled seating area, WC and washbasin with a vanity unit below. The "crows nest" lounge area has spectacular views and has a radio/CD player, puzzles, chess set, domino set and playing cards. It is furnished with comfortable cane seats, terracotta flooring and also has the original cane ceiling with wooden beams. The walls are also white washed. The kitchen/dining area has the original bread oven dating back to the 19th century and original floor tiles. The kitchen comprises of fridge with freezer compartment, microwave, electric kettle, toaster and gas hob. The kitchen/dining area also has the cane ceiling with wooden beams and has the typical Algarvian décor of white washed walls. From the dining area there are doors leading on to a completely private terrace with Bar-B-Q, table with cushioned seating and cushioned reclining chairs. There is also a wood burning stove for the cooler winter evenings. The Casa Do Forno Cottage has its own garden with a further rustic seating area and is surrounded by an abundance of beautiful flowers and shrubs. Here in the secluded garden you will experience some of the most breathtaking sunsets that the Algarve has to offer. This cottage also has its own private driveway access and carport. 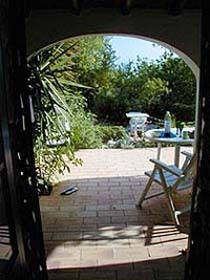 The Casa Do Forno Cottage (Bread Oven House) sleeps a maximum of 2 adults only. 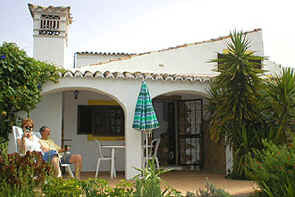 Prices are for the villa (not per person) and are based on 2 person occupancy. No children allowed in this cottage. There is a returnable security bond of £150 for this cottage. This bond will be returned after your holiday providing the cottage is left in a clean and tidy state and that there are no breakages.